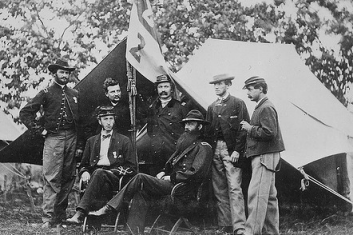 Series: Mathew Brady Photographs of Civil War-Era Personalities and Scenes ca. 1860 - ca. 1865. Season two of "Who Do You Think You Are?" has come to an end, but last week's episode was a true treat to watch. The episode explored Ashley Judd's ancestors, who accomplished some truly amazing feats. First she explores the life of her third great grandfather Elijah Hensley, a man who at the age of 15 enlisted to fight as an infantry member of the Union Army in the Civil War. Elijah was imprisoned twice by the Confederates, and ultimately lost his leg in a battlefield amputation before his honorable discharge in 1865. Ashley was touched to learn about Elijah's harrowing story, and his bravery in the face of adversity. Archives hosts several Civil War record collections that can help you trace your own ancestors. Learn more here. Next Ashley investigated her great grandfather William Dalton, whose death record led her to discover her relation to one of the founders of this nation, William Brewster. Brewster was born in the mid-16th century and was a notable member of the Puritan movement in England. Brewster immigrated to the U.S. on the historic journey of the Mayflower in 1620. Ashley was touched to learn about these two ancestors who had led such extraordinary lives. The journey helped to inform her passion for social justice, and strong principles, which have long been part of her family's legacy. What did you think of "Who Do You Think You Are?" Season Two? We hope you tuned in to watch these remarkable stories. If not, you can watch the episodes online at NBC.com. If you're ready to get started tracing your family tree Archives.com can help. Get started by visiting our expert article series written by professional and advanced genealogists. There you'll find informative articles published weekly, which provide practical advice, research tips, and more.